in the 11-3 titan win. “They (Tavi and Guille Usandizaga) just kept coming at us,” said Lufthansa team captain Scott Devon. “Every time you turned around one or both of them were right there,” said the 4-goaler from Michigan. Ben Rosenfield while holding a talented Lufthansa team scoreless. At the end of the first chukker, Titan commercial led 2-0. A penalty conversion from Guille Usandizaga put titan commercial up 3-0 before Lufthansa finally got on the scoreboard. Two consecutive penalty goals from former Canadian team captain Brandon Phillips cut the Titan lead to a single goal, 3-2, at the end of the first half, and an enthusiastic crowd looked to be in for an exciting finals. 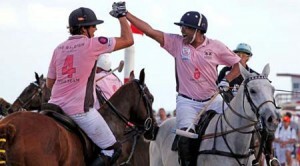 An energized Titan commercial team returned to the sand arena in the third chukker. The Titan attack caught the Lufthansa team still in the hanger as it rolled up six unanswered goals on its way to a commanding 9-2 lead with four goals from Guille Usandizaga and single goals from Tavi Usandizaga and Chad Middendorf (splitting the Number 1 position with Rosenfield). afternoon in the fourth, but it was a case of too little too late. The Usandizaga brothers continued to soar through the arena like a pair of Kamikaze pilots, with each scoring a final goal in the fourth chukker for the resounding 11-3 win. scored twice. Middendorf and Rosenfield added single goals. Phillips scored twice for Lufthansa and Devon added a goal in a losing effort. 2011 Grey Goose Chicago Beach Polo World Cup. Gascon opened the competition, scoring a 3-2 win over Amstel Light/Comcast as Chad Kraml scored all three goals in the win. Nadir Khan and Claudio Gauna scored single goals for the Amstel Light/Comcast trio. single goal from Coscia for the win. score from Gauna. The enthusiastic crowd was treated to a fabulous opening to the final two chukkers of play as Grey Goose opened the match with Coscia scoring a two-point shot that traveled the entire length of the arena for the early 2-0 lead. Marcelo Cabeza scored to make it 3-0 before Gauna scored a two-pointer for Amstel Light/Comcast to cut the Grey Goose lead to a 3-2, single goal lead. Two more goals from Coscia went unanswered in the final chukker as Grey Goose took the game, 5-2. Coscia led the scoring with four goals. Teammate Cabeza added a goal in the win. Gauna, the Culver Military Academy polo coach, accounted for both points for Amstel Light/Comcast in the loss. the debut of the Grey Goose North Beach Women’s Polo Cup. The finalists had been determined in Saturday’s contests with Gascon and Lufthansa Private Jet scoring wins over Grey Goose and Trump Residence, respectively, while Titan Commercial and LufthansaPrivate Jet emerged from the five teams in contention for the world cup. opening goal of the game for a 1-0 lead after the first period of play. Lufthansa Private Jet responded with goals from Megan West and Whitney Vogt (penalty conversion). Hornung’s first goal of the day had the score knotted up at 2-2 after the first half of play. Valerie Biehl opened the scoring in the third to give Lufthansa Private Jet a 3-2 advantage, but Gascon fought back to get the tying goal on a penalty shot from York. The score was all even at 3-3 with one chukker left to play in regulation time. Vogt’s second penalty goal of the game came in the fourth chukker and gave Lufthansa Private Jet a 4-3 edge with time running out when Tara Lordi scored her first goal of the game to knot it up at 4-4 as time expired. team taking turns until the winner emerged. Hornung, Lordi and York had captured the South Beach Championship in April in the same manner, and were confident of their chances in Chicago. With five of the first six shots going wide of the mark, and all three Gascon shots missing, it would be Vogt who would prove the difference scoring her third goal of the day for the Lufthansa Private Jet win. and Biehl added single goals in the win. York led the Gascon team with a pair of goals. Hornung and Lordi scored single goals in a losing effort. Vogt was named MVP for her efforts while Marcelo Cabeza’s Negrita, played by Tara Lordi, was named Best Playing Pony. In earlier action, Grey Goose scored a narrow 4-3 win over Trump Residence on a penalty shot from Samantha Falbe in the final seconds of regulation play to capture the consolation round of the Grey Goose North Beach Women’s Polo Cup. Trump took the early lead on first chukker goals from Nigeria’s Neku Atawodi and Tracy Regas, with Grey Goose settling for a lone goal from Brazilian Paula Chermont. Falbe tied it up at 2-2 in the second chukker, but Regas closed out the first half scoring with her second goal of the game for a 3-2 halftime lead for the Trump Residence trio. Both teams pressed the attack in the second half of play, but defense held firm. Penalty conversions from Aimee Waters in the third and Falbe in the fourth accounted for the final scores of the match. Falbe’s penalty shot came with seconds left to play and secured the win for the Grey Goose team.